It's getting mighty spooky outside. You have seen the calendar, right? It's October, and Halloween is right around the corner! Of course, we know that means that soon the streets will be lined with kids dressed in their favorite costumes, and for us grown up folks, there's only one thing to do. We've got to decorate the front yard! Sure, it's not a requirement, but it is a ton of fun. 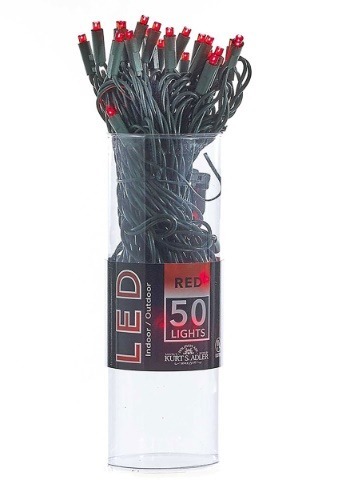 And you can set the mood for your trick-or-treaters just right when you get this Red LED 50 Indoor/Outdoor String Light Set! This Red LED 50 Indoor/Outdoor String Light Set features 50 purple wide-angle LED bulbs. They're wired together on a 25 and a half foot long wire, with a 4" lead, 6" of spacing between lights, and a 4" tail. With an end connection, you can connect up to 16 light sets together. They work great indoors or out! We've got outdoor decor and plenty of items to decorate inside for the party, too. Fact is, we've got the biggest selection of Halloween stuff to be found! Shop our entire site to make the right selections, and we're sure your haunted party is going to be epic.